The appearance of Angel Number 21, when your thoughts and feelings are becoming concrete, signifies that the guardian angels are prodding you to be conscious about your ideas. It is absolutely essential that you should approach the new transformations with confidence and hope, if you want to succeed in the new projects. Angel Number 21 symbol is forcing you to convince yourself and to make positive assertions regarding your determination to succeed in your ambitions. There is no place for doubt and you should have trust in the Supreme Power who will guide you to attain your ambitions. Your overall outlook should be optimistic about all the phases of life. 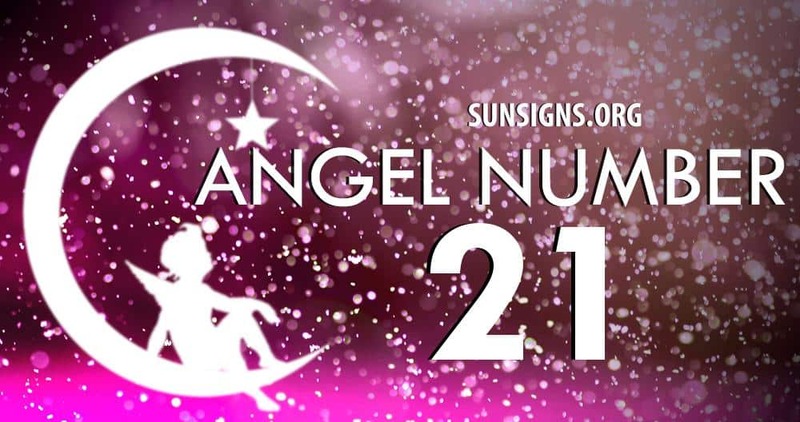 Angel number 21 meaning is an amalgamation of the forces of Number 2 and Number 1. Number 2 works on a spiritual plane and contemplates about the actual objective of existence and the real rationale of life itself. Other energies of Number 2 are unselfishness in your associations and liaisons, and the support you will provide for these. It also indicates striving for stability while facing contradictions. Number 1 incorporates the qualities of evolution in life resulting in accomplishment of the intended goals and development in life. It is indicative of fresh progress, enthusiasm and the urge to move ahead in spite of obstacles. Liberty and individuality are the other attributes of Number 1. Whenever Angel Number 21 presents itself again and again in life, you will encounter fresh openings or new road for development which will be novel and stimulating. You can rest assured that angel numbers will be with you throughout the new journey and support your new ventures unconditionally. Your birth ngels will be a source of inspiration and confidence which will help you to maintain your poise and remain unruffled and cheerful throughout the course. Naturally the end result will be highly gratifying. Angel number 21 symbolism also requires that you should not be swayed by your past beliefs or the ideas of other people when you are pursuing your new avenues for growth. If you feel that other people are proving an impediment for your growth with their thinking or presence, you should act boldly and eliminate these obstructions.